Studio portrait of Australian Prisoner of War (POW) 3563 Private (Pte) Herbert George Lohmann, 54th Battalion from Balmain NSW at German POW Camp III, Munster, Germany. Pte Lohmann enlisted 2 November 1915 and embarked for overseas on 12 December 1915 aboard HMAT Berrima. 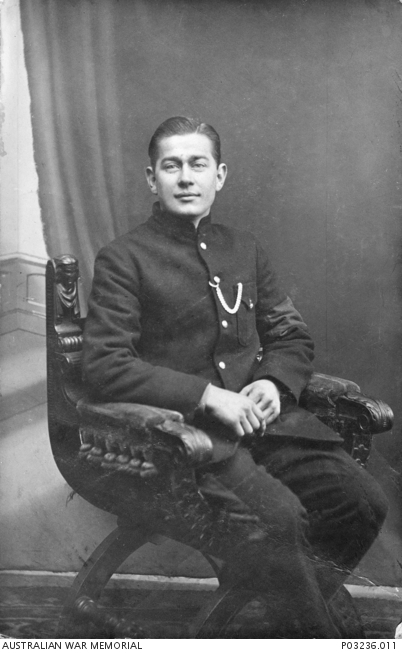 He was captured in France on 20 July 1916 and was interned in at least two POW camps in Germany. He returned to Australia in April 1919. One of a series of over 400 photographs sent by Australian POWs in German camps to Miss M. E. Chomley, Secretary, Prisoners Department, Australian-British Red Cross Society, London. Original album housed in AWM Research Centre at RC00864, Album image number 22. Outdoor portrait of Prisoners of War (POW) and their German guard at POW camp Munster 3, Germany. The POW sitting in the centre is holding a football inscribed “432 F.C. 1918” and the two sitting in front are holding a dog and a rabbit, pets or mascots. Identified standing in the back row, second from the right is 3219 Private (Pte) Raymond Edward Stevens, 54th Battalion, from Bega, NSW, who enlisted at the age of 21 on 2 August 1915 and embarked for overseas on 20 November 1915 aboard HMAT Suevic. He was captured at Fleurbaix, France, on 20 July 1916 and held as a POW until repatriated to England on 14 December 1918. Pte Stevens arrived back in Australia on 4 March 1919. Identified standing in the back row on the far right is 3536 Pte Charles Joseph McCue, 53rd Battalion, from Manly, NSW, who enlisted at the age of 20 on 18 August 1915 and embarked for overseas on 2 November 1915 aboard HMAT Euripides. He was captured at Fleurbaix, on 20 July 1916 and interned at various German POW camps. He was repatriated to England on 14 December 1918 and arrived back in Australia on 26 March 1919. He re-enlisted in the Army in the Second World War and served from 13 December 1939 to 29 September 1943. Identified sitting in the second row, second from the right is 3067 Pte James McCullock Galloway, 55th Battalion, from Balmain, NSW, who enlisted at the age of 20 on 4 August 1915 and embarked for overseas on 20 December 1915 aboard HMAT Suevic. He was captured on 20 July 1916 during the fighting around Fromelles on the Somme, France. He was held in German POW camps until he was repatriated to England in December 1918. Pte Galloway embarked to return to Australia on 2 March 1919. 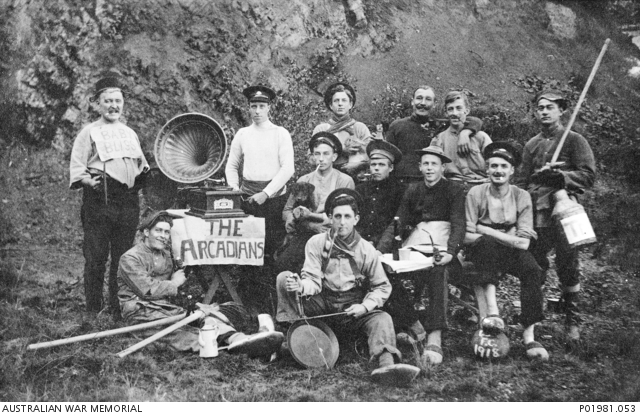 Identified sitting in the second row on the far right is 3339 Pte John Francis Killalea, 53rd Battalion, from Surry Hills, NSW, who enlisted at the age of 43 on 15 August 1915 and embarked for overseas on 2 November 1915 aboard HMAT Euripides. He was captured at Fleurbaix, on 20 July 1916 and held as a POW in Germany. Pte Killalea was repatriated to England on 14 December 1918 and arrived back in Australia on 26 March 1919. 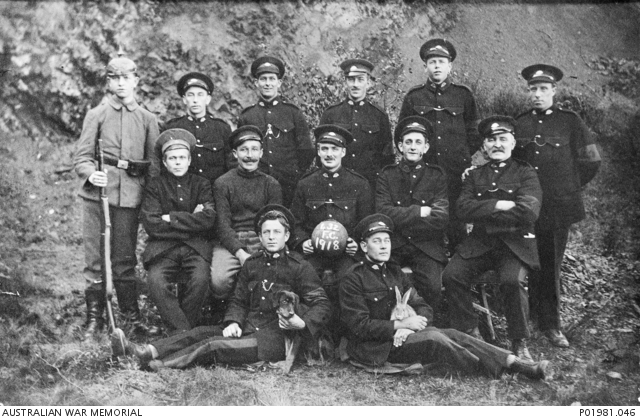 Identified sitting on the right in the front row, holding the rabbit, is 3563 Pte Herbert George Lohmann, 54th Battalion from Balmain, NSW, who enlisted on 2 November 1915 and embarked for overseas on 12 December 1915 aboard HMAT Berrima. He was captured at Laventie, France, on 20 July 1916 and was interned in at least two POW camps in Germany. He was repatriated to England on 14 December 1918 and arrived back in Australia on 26 March 1919. These same POWs appear in image number P01981.053 in fancy dress. One of a series of over 400 photographs sent by Australian POWs in German camps to Miss M. E. Chomley, Secretary, Prisoners Department, Australian-British Red Cross Society, London. Original album housed in AWM Research Centre at RC00864, Album image number 298.